I went out for a few hours and collected almost 1kg of glass. It was everywhere, a very exciting find! Pieces were frosted and oddly shaped, smooth but not round ornery uniform shapes. Some were also more aged and not so frosted, newer pieces i guess. A huge array of colours as well. One blue piece, one purple one yellow and the rest a nice mix of brown and green. 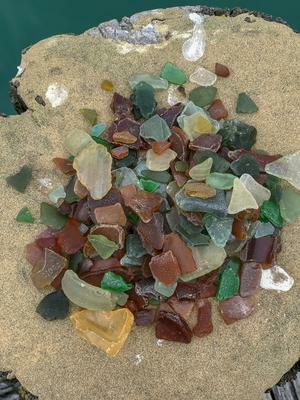 Most of the glass was found in Akaroa and then Duvauchelle, also I stopped at various small bays in between and found glass at every beach. That is a fantastic find, I am exploring beaches at the other end of New Zealand and work hard to find good pickings. That is so exciting. I wish I could be there.